My recent trip to Japan was a work trip, but I made time to explore and support the excellent culinary community there. It wasn't hard to find deliciousness, especially with all the great suggestions you left in the blog comments. I could go on for pages on all the great food we had, but I'll start with okonomiyaki since that was a key focus for me, and with an itinerary that included Osaka and Hiroshima, I visited the areas that stake the strongest claim to core okonomiyaki styles. (I also had monjayaki in Tokyo, a similar dish.) Okonomiyaki can be hard to describe, but in short, it's a savory dish that's a bit of a cross between an omelet and a pancake. 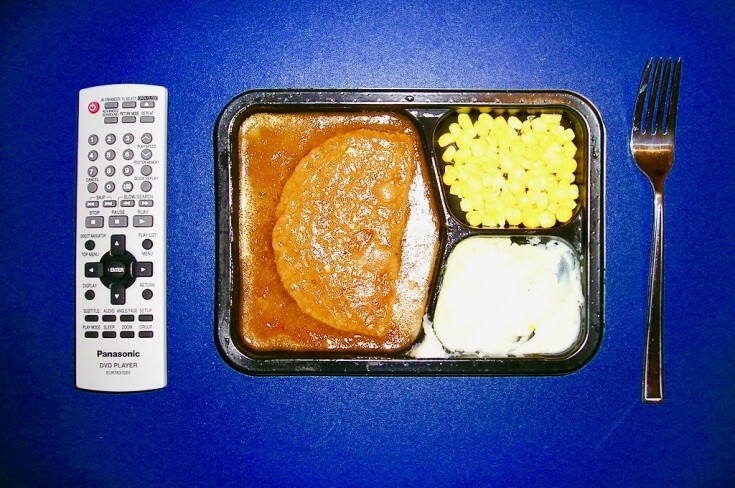 It's batter with various meat and vegetable toppings, cooked on a flat top grill. The name roughly means "cooked your way." 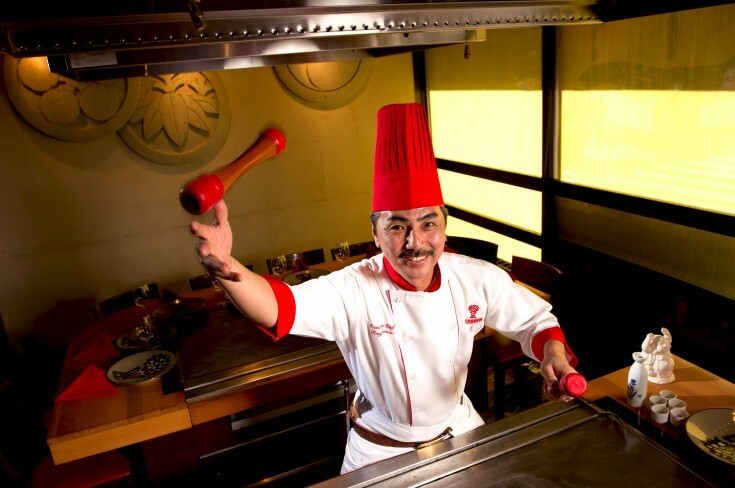 Many places sit you in front of a hot grill, give you the ingredients and put you to work making your own. Fearing disaster or at least a subpar meal, I let the experienced cooks handle mine. 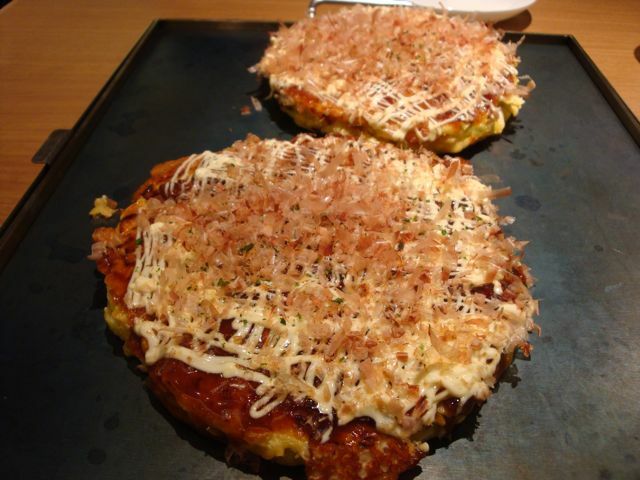 So which city makes the best okonomiyaki? First, the differences. The first picture comes from Osaka. All the ingredients are mixed together and distributed throughout. The ones we had came doused with MSG mayo (sprayed with subtle precision from the truly brilliant Magic Five dispenser that's everywhere in Japan) and covered in fish flakes. We had several varieties and all were delicious. The Hiroshima style shown in the second picture is notable that it includes fried noodles. And unlike the Osaka specimen, here the ingredients are layered rather than mixed in. 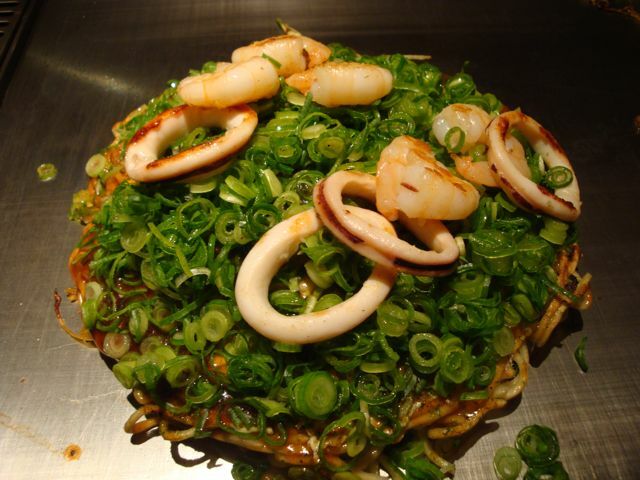 Note the squid and lush forest of green onions. I thought it would be onion overload, but it was fantastic. I didn't get a pic of the monjayaki we had in Tokyo, but this site has pics and English explainers. It's a more liquid, runny batter that yields a different texture. I especially liked the heavy cabbage presence, which gave it a different crunch. Changing background music can make chocolate taste sweeter. And you can tell whether you're cutting scallions correctly by the sound they make. 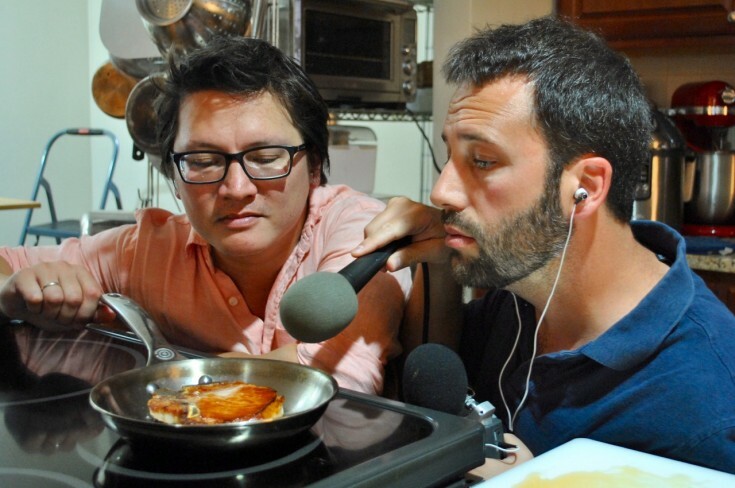 Hear (and taste) the difference yourself in this show!